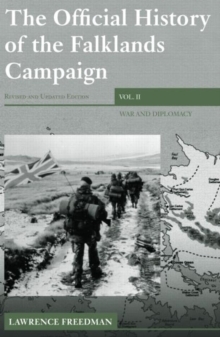 24 cm xxxv, 859 p.
In the second volume of his "Official History of the Falklands Campaign", Lawrence Freedman provides a detailed and authoritative account of one of the most extraordinary periods in recent British political history and a vivid portrayal of a government at war. After the shock of the Argentine invasion of the Falklands in April 1982, Margaret Thatcher faced the crisis that came to define her premiership as she determined to recover the islands. The book covers all aspects of the campaign - economic and diplomatic as well as military - demonstrating the extent of the gamble that the government took. There are important accounts of the tensions in relations with the United States, concerns among the military commanders about the risks they were expected to take, the problems of dealing with the media and the attempts to reach a negotiated settlement. This definitive account describes in dramatic detail events such as the sinking of the "Belgrano", the Battle of Goose Green and the final push to Stanley. Special attention is also paid to the aftermath of the war, including the various enquiries, and the eventual restoration of diplomatic relations with Argentina. This paperback edition has been updated, corrected and contains some new material.